The Life-Changing Magic of Tidying Up by Marie Kondo is a best seller, not only on Amazon and the New York Times, but also internationally. You’re probably thinking the same thing I was. An international best seller about tidying up? How is that possible? 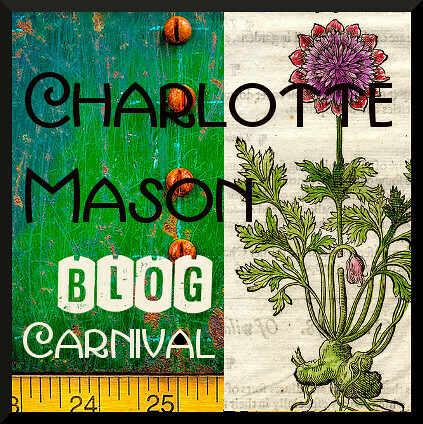 Not being a naturally tidy person (although it’s amazing how much one can learn!) but loving the serenity that comes with tidiness, I let my curiosity about this book get the better of me. And, really, tidying is an important topic for every homeschooling mom because, with children, school supplies, and projects always underfoot—to say nothing of food preparation and laundry and books—a disastrous mess is often only a few minutes away. Of course, we all know the basic advice: dejunk regularly, have a place for everything, keep only things you love, and so forth. But, for some reason, it seems we’re always working on it and the process never, ever ends. Marie Kondo, however, claims that once you’ve tidied up completely her way, a process that will probably take a few months, you will never need to do so again. Why? Because once you experience the joy that comes with a completely tidy home you will never want to go back to the old way again. There’s also another side to this. Marie Kondo’s advice is based on her firm conviction that putting your house in order will help you find the life goal that speaks to your heart. Not only will living in a tidy house, surrounded only by things that give joy, increase your energy, but the actual tidying process itself will also change you. By recognizing, item by item, what gives you joy, you learn decision-making skills that enhance your confidence and energy and give you the experience and self-knowledge you need to make decisions about relationships and career…and, for us homeschooling moms, about the many facets of education our children. This book gives practical instructions on what to tidy first and exactly how to go about it as one learns these decision-making skills. It is important to begin with simple decisions and to leave the complicated ones to the end. Step by step, Marie guides the reader through the process. She is a kind and wise guide. However, The Life-Changing Magic of Tidying Up may not be an ideal book for most Christian homeschoolers. Marie was a Shinto shrine maiden for five years and her religious reverence for possessions and her constant communication with them is foreign to us Christians. This book is such a shocking immersion into an empty lifestyle that it drives me to prayer. On the other hand, as Augustine pointed out so long ago, truth is truth where ever it is found, and this book has a lot advice that is very different from most Western thoughts on the topic. There is definitely more than a kernel of truth in what Marie Kondo says about tidying. What’s more, we can also learn to be a whole lot more thankful than we are for all the material goods that God has given us. Yes, we can learn from Marie about actively thanking God for the things he gives us and also about thanking him for the opportunity to give away the things we no longer use. Perhaps we should even be asking forgiveness for wrong choices and offering praise for the ability to let things go. The Life-Changing Magic of Tidying Up is a book about personal transformation due to learning the simple discipline of tidying up one’s possessions. This is certainly not a Christian book, but its basic principles of gratitude should be part of every Christian life. What’s more, it gives a deep, authentic look into the thoughts of someone from a Shinto background, helping us understand yet again how much the world needs to learn about Jesus. 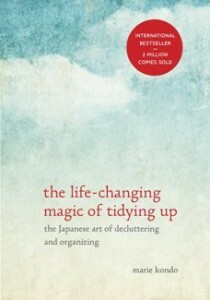 If you struggle with tidying up, this book may be for you. Marie’s results as a single woman—never needing to tidy up again— may not be valid for moms and homeschoolers, but they are still at least partly valid. We just have more to deal with. In any case, I can vouch that her decision-making approach, where I’ve used it, is valid and empowering, although I have not gone through my whole house or even major parts of it. But The Life-Changing Magic of Tidying Up is about so much more than tidying up, as I’ve tried to show. I found it a beautiful and poignant book, inspiring in many different ways. Alexandra of Life on a Canadian Island presents an illustrated discussion of how she is using Marie’s principles on her clothes, books, and other things. For more encouragement, visit Raising Homemakers, Titus 2 Tuesday, Works for Me Wednesday, Mom to Mom Monday, Monday’s Musings, Missional Weekend, R&R Wednesdays, From House to Home, Homemaking Mondays, Good Morning Mondays, Make Your Home Sing Mondays, Faith Filled Fridays. Disclosure: I received this ebook from the Blogging for Books review program and have expressed my own honest opinions. Thanks so much for your in-depth review. I, too, review books. I considered this one, but was scared off by the Eastern religion. You’ve made it clear how Christ redeems. All I know is that when my house is tidy, I am happier. Unfortunately, it never stays tidy long. I would love to see how this author keeps her home tidy all the time. She must not have kids? You are welcome, Laura. Yes, Christ has redeemed us from a very empty lifestyle. Let me know what you think, Nelleke, both from a practical and a philosophical point of view. Yes, Jenn, a tidy house brings peacefulness, doesn’t it? No, the author does not have kids, but when I use her methods things stay tidier than when I don’t. I love your review of this book. I love your honesty and your ability and willingness to look for and find truth and reject deception. Thanks for being a part of Booknificent Thursday. I wanted to read this book but was afraid I wouldn’t like it. Your review of the book confirms what I thought I’d gain from the book. 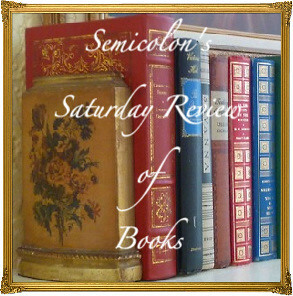 I’m looking forward to more of your reviews at Literacy Musing Mondays. Oh, how I love books! I’m wary of this book, but like you, was curious what the buzz was around this book. I do try to keep a tidy home, have limited my own clothes, and try to purge frequently, so we’ll see what else I could be doing towards this end. Thank you for your encouragement, Tina! It means a lot to me. I’m glad my review helped you make up your mind about this book, Tami. It’s so neat that we’re reading the same books, Heather! I think you’ll find this one fascinating on several levels. I just put an oder in at OPL…. I am 473 ob 20 copies… perhaps it will make my 2016 reading list. I liked this book a lot (found your review linked from Life as Mom). Like you, I am a Christian, and like you, wondered about some of her religious ideas but ended up finding merit in the book as a whole. Thank you, Kelly, for your thoughtful comment. I’m so sorry I never responded before, but it is so good to thank God for things one by one, isn’t it? Sometimes we forget that. Your mom sounds like someone I can identify with! Thank you for your very thoughtful review. I’ll still read it, but I won’t give it as a gift, as I considered, as I don’t want to lead anyone away from Jesus. God bless you, Annie Kate. You’re welcome, Kat. I agree that this is not an ideal gift book, although it can be very helpful. God bless you, too. I feel you on the Shinto parts being not quite working for you. I am Muslim and just groan at bits of it but I do like the idea doing a once and for all organization and continuing with a given method for the rest of my life. I do wonder with homeschooling if this will work well though as I am selecting items for my children as well as myself and do need to think ahead. Vials of blue dye for staining samples for biology give me much DISpleasure but my teen needs it. IDK, I am reading this for my book club and want to reduce the amount of stuff and work homeschool items involve. We’ll see. Yes, thinking ahead is a big part of homeschooling. Even if we don’t like a curriculum or a book with one child, it may be just right for another child. I do not think that what Marie said should apply to homeschooling resources if one has more children needing to use them, or our other projects for the future, even if they currently do not give joy. On the other hand, there are many people who hold on to the past by holding on to ‘stuff’, and I think that is what she is talking about. Thank you for sharing an open-heart perspective on this book and the methods. Netflix just launched a show version. I really love to clean, but I find myself looking at the same organized closet after organizing it. I want space saving tips, like Martha’s towel folding method. This show doesn’t seem to provide that. Instead, it appears to address emotional attachments long before crisis mode. A good Christian is expected to avoid idolatry. We’re also expected to love enemies and it’s hard enough just to love family. Looking at materials as animated things certainly does seem culturally strange, but you’re right about that grain of truth. We can thank God, let our faith, and still flourish from the wisdom of joy concept that the designer nurtures. Thank you for noting that. Thank you for your insightful comment and for letting me know about this show. Yes, the book addresses emotional aspects; often decluttering is as much an emotional as a physical process, I suppose. And, fundamentally, often spiritual issues are involved as well. The author addresses that in a very different way than Christians would.